Can anyone tell me where Whitelaw's Scottish targe classification is published? Or, would anyone care to share the relevant pages? That is, is the targe classification in his Scottish Arms Makers, his museum book, a journal article, or... ? The Charles E. Whitelaw targe classification is unpublished. Stuart Maxwell published a classification system in Scottish Art Review, Vol. 9, No. 1, 1963, "Scottish Weapons." This stuff is hard to track down. Hi Richard and welcome. Sorry you didn't get any responses to your question. As you said this is hard to track down. If you do happen to come across any classification of targes then please do share your findings. Best of luck. Hi, and thanks for the welcome. I'll try to ask simpler questions from now on (LOL). and the O'Donovan Irish shield? The first is very common in Scots targes, like the Laird of Grant/Seafield, the Elgin Museum, etc. etc. both in nail pattern and tooling. The O'Donovan type definitely shows up, on a simple targe in the Kelvingrove, and a slightly more complex targe in the Inverness Museum. I think it was also copied frequently in the 19th century. P.S. all images were gleaned from the web. What is it you want to know about these Irish targes? I'm afraid I don't know as much as I would like about them, but what specifically would you like to know? Well, primarily are they what they are claimed to be, Irish, and 16th century? If they are indeed Irish and 16th century, they predate any known Highland targe, and may represent prototypes of their Highland relations. I think that would be significant. 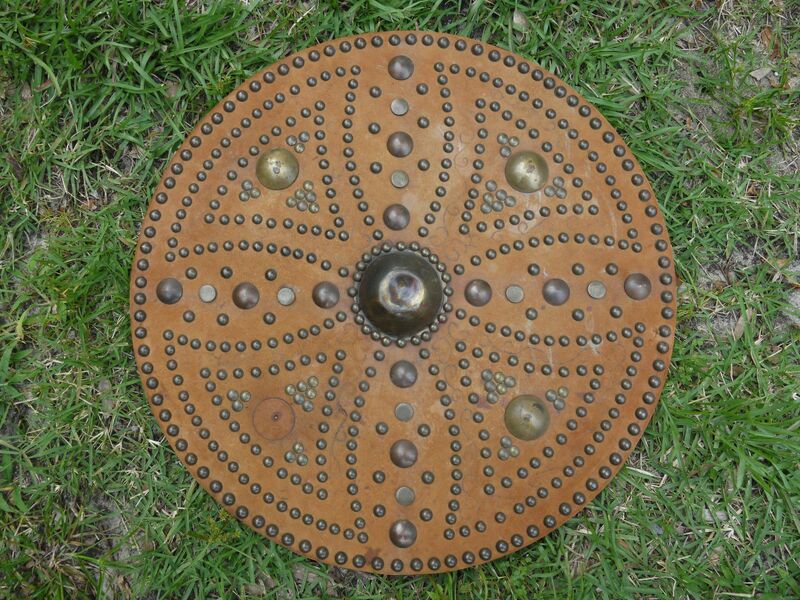 The Bronze Age Yetholm type shield is similar in pattern to some Highland targes of the 17th/18th centuries, but the bronze shields weren't rediscovered until after the Highland targe era. So the coincidence in pattern is not significant. They all look like domed iron more than wood. I think the Derricke shields are generally assumed to be iron, but I suppose they could be painted leather over wood. 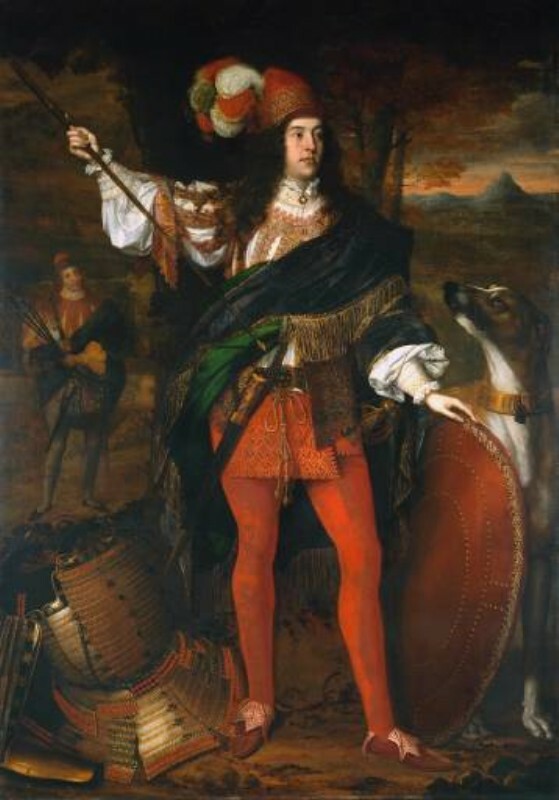 The Earl of Mar used a gilt iron shield in the 1715 Jacobite Rising. It looks remarkably similar to the Charles I shield in the Royal Armoury Collection. That's the one made for him when he was Prince of Wales. I have no clue where the Mar shield is today. Anyone? The sword on the right is incredible! As far as I know the Irish shields are both from Ireland and from the 16th century. The following is from memory, as I can't seem to find my notes, but perhaps Kevin P. Molloy, if you're out there, you might chime in. The first of the Irish targes was last known to have been in the private collection of a Mr. Bell. 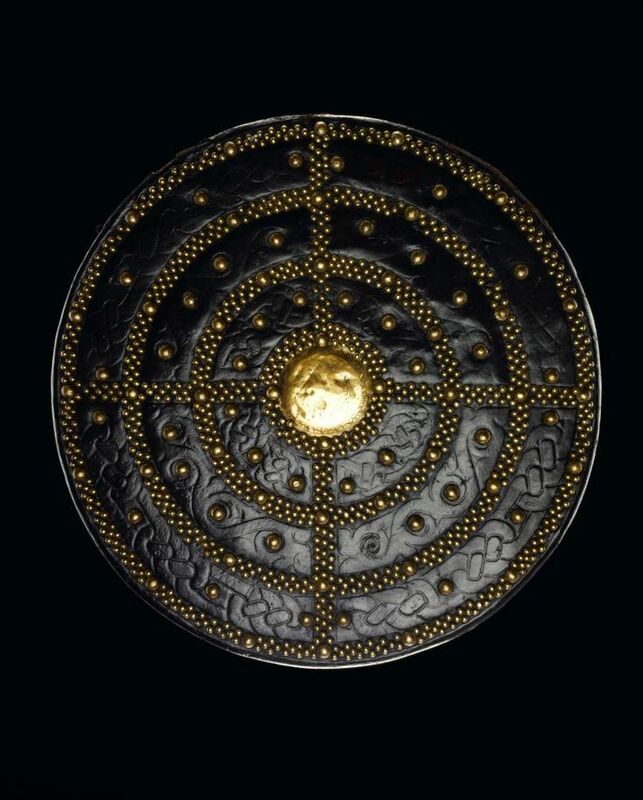 I don't remember if there is any particular information that suggests that this targe was 16th century Irish, only that it was acquired from an Irishman. 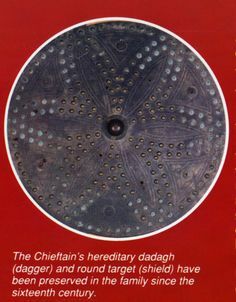 The second targe is traditionally believed to have belonged to a 16th century Chieftain of the O Donovan family. It is currently over the fireplace at Lissard Hall, Co. Cork. Of course it is possible that neither of these targes are 16th or Irish, but at least in the case of the O Donovan targe I tend to believe in it's history. Even if these targes are indeed 16th century Irish, I don't think that they should be considered as prototypes for later Highland targes. To me they are not different enough from later targes to be prototypes. As far as I know, the oldest targe that we are certain of dates to 1623 (dated by an engraving on the boss). Of course there are literally references for targes which predate this. As for the apparent similarities between Bronze Age shields and targes, I believe this is just coincidence.
" I believe this is just coincidence." Absolutely, just the same as the "small shields" of the Picts. I hadn't actually thought that the "Irish" targes might not be Irish....silly me. Well going on the information that Sean linked to, the first of these "Irish" targes was passed down in the Hamilton Rowan family for many years. The Hamiltons are a family from Ayrshire in Scotland, and didn't move to Ireland until 1606. So it looks less likely that this targe was either Irish, or from the 16th century. Thanks for the topic link... I had seen the images, and read the paper on Japanese armour, but missed the discussion. The O'Niel's shield and dog seem out of proportion with the rest of the painting. 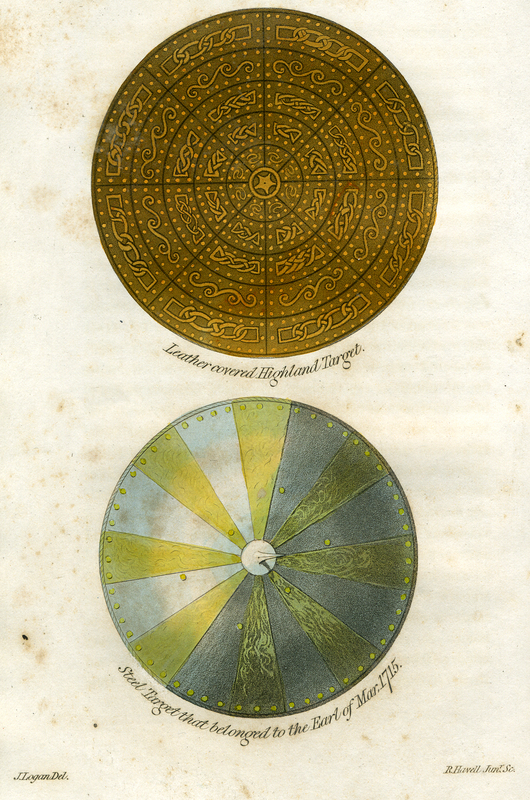 Re: Picts, yes, round shields are found the world 'round, and throughout history. The MacKay targe of 1623 was mentioned. 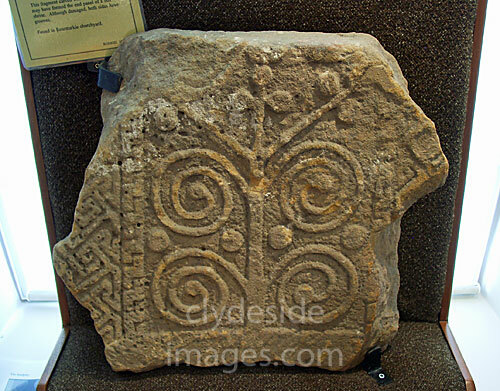 What interests me here is that the leather tooling has a tree motif that is also seen on Pictish monuments. This is a tree with large globe endings to some of the branches. I may be going out on a limb, but these remind me of the silver apple tree with golden apples that is mentioned often in early Irish folklore. 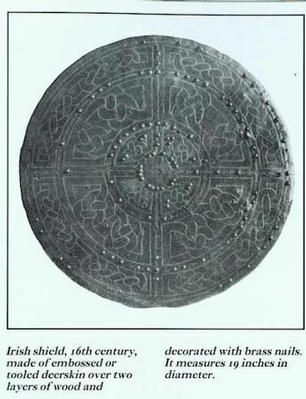 Which is where this Irish shield was first published, in an article on "Some Early Ornamented Leatherwork" which starts on page 300. The article also mentions the O'Donovan shield, and one other. If the shield was from Ayrshire, it's not Highland. The shield descended in the Hamilton Rowan family, but there's nothing to indicate that it was made for the family. So there's no reason it couldn't be Irish, and no reason it couldn't be 16th c.
Stylistically, it has a lot in common with a number of Highland targes. There are two differences, though: no boss, and many fewer brass nails than is typical in the Scottish. And we know very little about who made targes, other than W. Lindsay, Perth, who was a wright. Travelers? Maybe some.